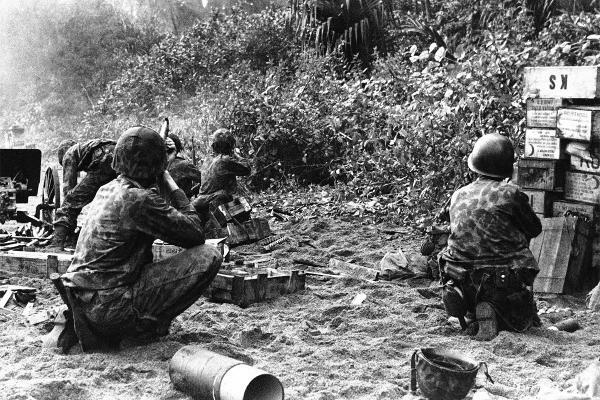 On June 21st, 1943, elements of 1st and 4th Raider Battalions participated in the occupation of Segi Point, New Georgia, in the British Solomon Islands. For the next week, the battalions fought in several key battles of the New Georgia campaign, to include Choi River, Viru Village, and Tombe Harbor. In early July, the Raiders consolidated on the island and participated in the Battle of Keruka, Wickham Anchorage. The fighting on New Georgia continued for another two months, with the battalions leaving for good in late August. Both units eventually made their way to New Zealand for Rest and Rehabilitation.